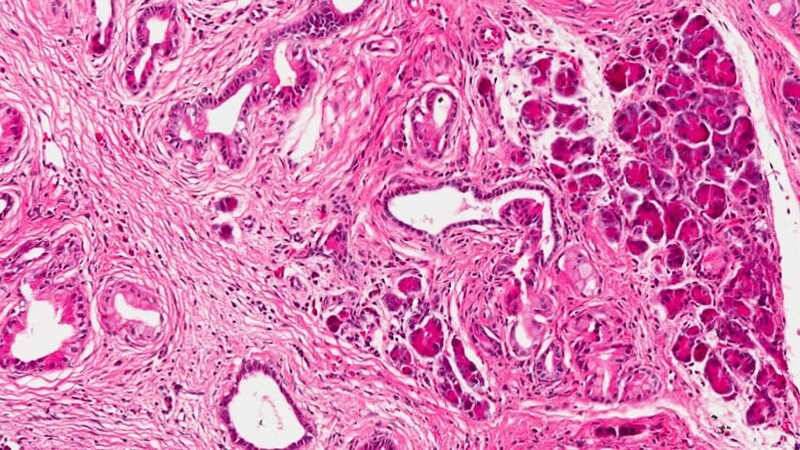 The ‘Achilles’ heel’ of pancreatic cancer has been identified, according to new research. It is a protein that fuels the tumour – offering hope of a drug that stops it in its tracks, say scientists. Known as LIF (Leukaemia Inhibitory Factor), the chemical activates the tumour’s main cells. This causes them to spread to other organs, a process known as metastasis. Eight in ten sufferers are diagnosed at an advanced stage when life-saving treatment is not an option. Medications targeting the protein may slash death rates, say the international team. A screening program that identifies LIF would also enable these therapies to be delivered sooner – when they are more likely to work. Pancreatic cancer has been dubbed the ‘silent killer’ as it’s usually symptomless – meaning most cases are not picked up until it’s too late. It often responds poorly to chemotherapy due to the presence of tumour cells located within the dense protective tissue, called the stroma. This mainly comprises pancreatic stellate cells (PSCs) which interact with the tumour – causing it to grow and migrate to other parts of the body. The study published in Nature found LIF is responsible for the activation of PSCs in the cancer cells. In a normal pancreas levels of the protein were undetectable but were dramatically elevated in the tissue of patients with Pancreatic Ductal Adenocarcinoma (PDAC). This is the form of pancreatic cancer that strikes about nine-in-ten patients and is by far the most aggressive. In both mouse and human pancreatic cancer tissue LIF was elevated – indicating the PSCs are also responsible for its production. The results also suggest LIF may be a useful biomarker to help diagnose pancreatic cancer more quickly and efficiently, they said. Prof Hunter explained: “There haven’t been very many advances in pancreatic cancer therapy because it’s a difficult cancer to diagnose and treat. The National Institutes of Health (NIH) predicts pancreatic cancer will be the second-leading cause of cancer-related deaths in the US by 2030. Last year, the NIH reported roughly 55,000 new cases of pancreatic cancer – with over 44,000 deaths from the disease. In the UK it kills almost 9,000 people annually. First author Dr Yu Shi, a postdoctoral fellow at Salk, said: “Most solid cancers are not caused by abnormality in a single cell type. “Instead, the tumour cells live and work cooperatively with surrounding normal cells in the tissue. They can also ‘go bad’ together as an unholy alliance, which can lead to cancer. LIF normally helps stem cells maintain their developmental potential during the embryonic period – but usually vanishes in adulthood. When LIF was blocked in a mouse model of pancreatic cancer, tumour progression slowed and responses to chemotherapeutic drugs used in treating human cancer – such as gemcitabine – were improved. Prof Hunter said: “Previous studies have shown that if you kill the pancreatic stellate cells, then the tumors get worse. The researchers also found high levels of LIF in tumour tissue and blood from human pancreatic cancer patients. There was also a strong link to disease progression and response to chemotherapy. It suggests LIF holds promise as a biomarker for pancreatic cancer stage and treatment success. The study also found LIF was a better indicator of therapeutic response than CA19-9 – a carbohydrate that is currently the only Food and Drug Administration approved biomarker for pancreatic cancer. Prof Hunter said: “One possibility would be to use a combination of the two biomarkers to get a better picture of the disease status and response. “We also think the anti-LIF antibody therapy could be useful, in combination with other therapeutics, to treat pancreatic cancer. A clinical trial has now been initiated by Northern Biologics, a Canadian company, to test the effect of treatment with an antibody that blocks LIF. The results are awaited with great interest, said Prof Hunter.